There has been a lot of discussion on the poor state of farmers in India. Farm loan waivers by the newly elected Congress governments in Madhya Pradesh, Rajasthan and Chhattisgarh have hit the national headlines. According to a report published in MINT newspaper on January 22, 2019, Indian Government is considering a plan to transfer cash to farmers instead of offering subsidies on various agricultural inputs. “The government is planning to club all farm subsidies including fertiliser costs and instead pay farmers cash…,” notes the article. The plan for the handout comes after the Bharatiya Janata Party was voted out in key state elections last month, forcing the government to draw up a course correction before federal polls due by May. 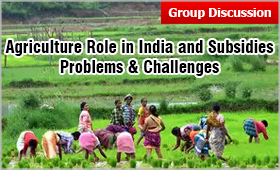 Given the size and the dismal state of Agriculture in India, this is a hot Group Discussion topic for MBA admission. MBAUniverse.com presents an indepth analysis of this MBA GD Topic that analyses the current state, problems and solutions. Agriculture contributes to 6.4% of the total world’s economic production. China is the largest contributor followed by India accounting for 19.49% and 7.39% of the total agricultural output respectively. India is the first and foremost an agriculture-based economy with 47% of its working population employed in the agriculture sector while China employs only 29.5% of its population in agriculture. With about half its population employed in agricultural activities, this should be a prominent source of India’s GDP if not the main source. In India, agriculture constitutes 17.32% of GDP as per 2018 data and this value has remained somewhat constant since 2011. With the advancement of technology, capital is becoming a key factor in the development of agriculture. According to the NABARD, All India Financial Inclusion Survey (NAFIS) conducted by National Bank for Agricultural and Rural Development (NABARD) in 2016-17, 43.5% agricultural households reported to have borrowed any money from some source or the other. 60.4% of them reportedly borrowed from institutional sources exclusively. Further, 30.3% borrowed from only informal sources and 9.2% of agricultural households borrowed from both sources. The rural population is widely dependent on local money lenders for loans who charge very high interest rates. According to 2015 National Crime Records Bureau data, as many as 8,007 Indian farmers committed suicide in 2015, an increase of 41.7% from 5,650 in 2014, 39% of farmers who died in this manner were in debt. In 2014, 20.6% of farmers who killed themselves had borrowed money. ccording to NAFIS, the average size of agricultural land holding of a household is 1.1 hectare in 2015-2016. Even the state wise average land holding was quite uneven. While Nagaland (2.1 ha), Rajasthan (1.9 ha) and Haryana (1.7 ha) reported higher land sizes per household, it was around 0.5 Ha in Bihar, West Bengal, Tripura, Sikkim and Jammu & Kashmir. This fragmentation of land is blamed mostly on inheritance laws where in the land sizes grow smaller with each passing generation and the smaller size of land leads to less productivity. Seeds: The yield is mainly dependent on quality of the seed. High Yielding Variety Programme (HYVP) was launched in 1966-67 to increase the seed production in India. Although the seed production has increased, these seeds are not available to a large number of farmers due to their high prices. Chemicals: The agricultural prosperity of a country is measured in terms of amount of fertiliser used. India’s low yields are owed to the continuous production without adequate soil nourishment which is done using manure and fertilisers. Chemical fertilisers being costly, cow dung is the most effective natural manure but it is mainly used as kitchen fuel in form of dung cakes. India has a potential of 650 million tonnes of rural and 160 lakh tonnes of urban compost which is not fully utilized at present. The utilization of this potential will solve the twin problem of disposal of waste and providing manure to the soil. Mechanical Equipment: Despite large scale mechanisation in some parts of the country, majority of farmers (small and marginal) still use conventional hand tools for most of their farming operations. NAFIS showed that only 5.2% of agricultural households in the country owned a tractor and 1.8% owned a power tiller. This results in wastage of human labour and lower yields per capita labour force. Irrigation: Despite being the second largest irrigated country in the world after China, only one-third of cultivated land in India is irrigated. India, where rainfall is uncertain, irrigation is a major factor that needs to be looked upon to increase yields. Access to drip irrigation and sprinkler was limited to 1.6% and 0.8% families respectively according to NAFIS. Punjab, Haryana and western Uttar Pradesh where more than half the lands are under irrigation have seen tremendous increase in production. After harvest, farmers usually sell off their produce at throw-away prices due to lack of storage facility and the ever-increasing burden of debt. This produce is often sold to local traders and money lenders at very low price. The Rural Credit Survey Report remarked that producers in general sell their produce at an unfavourable place and at an unfavourable time and usually get unfavourable terms. Many market surveys have revealed that middlemen take away about 48% of the price of rice, 52% of the price of groundnuts and 60% of the price of potatoes offered by consumers. Apart from this about 6.6% of the total produce is lost due to inadequate storage facilities. Although India’s total land area is slightly more than one-third of China’s, its arable land is marginally bigger than China, being second only to that of USA. Despite this, India contributes to only 7.39% of the global agricultural output while China contributes 19.49%. The productivity of Indian agriculture is quite low as compared to that of China which can be attributed to the high land-man ratio, lack of mechanisation, lower capital and many other reasons. According to World Bank Economic Indicators Indices, Indian agricultural productivity is 1202.45 USD against an arable land of 52.6% while China’s is 1529.17 USD against 12.7% arable land in 2016. Rythu Bandhu Scheme 2018: Also known as the Farmers’ Investment Support Scheme, it is a welfare program started by the Government of Telangana in May 2018. It is the first direct farmer investment support initiative in India, where cash is paid directly to the farmers. Rs 4000 per acre is to be provided to each farmer twice a year. 58.33 lakh farmers are recipients of this fund. Some affluent farmers have been encouraged to forego the support under Give it up option and the money saved goes to the Rythu Samanvaya Samithi (RSS) corpus. AGRI UDAAN 2017: Indian Council of Agricultural Research (ICAR) and the National Academy of Agricultural Research Management (NAARM)’s technology business incubator a-IDEA launched Agri-Udaan, a food and agribusiness accelerator 2.0 in August 2017 along with IIM Ahmedabad’s Centre for Innovation, Incubation and Entrepreneurship (CIIE). This initiative promotes agricultural innovation and start ups and helps them gain mentorship and potential investment. SAMPADA 2017: To obtain the goal of doubling farmers’ income by 2022, the Government of India approved Pradhan Mantri Kisan SAMPADA Yojana (Scheme for Agro-Marine Processing and Development of Agro-Processing Clusters) with an allocation of Rs 6000 crore during 2016-20. SAMPADA will be implemented by the Ministry of Food Processing Industries (MoFPI). The scheme aims at creating modern infrastructure and an effective supply chain management from farm to retail to help farmers get better returns on their produce. Agriculture storage capacity in India increased at 4% CAGR between 2014-17 to reach 131.8 million metric tonnes. The Government also launched an umbrella scheme Pradhan Mantri Annadata Aay SanrasHan Abhiyan (PM-AASHA) in September 2017 to help farmers get adequate prices for their produce. The scheme has three parts Price Support Scheme (PSS), Price Deficiency Payment Scheme (PDPS) and Private Procurement and Stockist Scheme (PPSS). While PSS sees that the expenditure and losses due to procurement of pulses, oilseeds and copra will be borne by the centre, PDPS proposes to cover all oilseeds and pay farmers directly in their bank accounts the difference between MSP and actual selling price. In the case of oilseeds, States will have the option to roll out PPSSs in select districts where a private player can procure crops at MSP when market prices drop below MSP. The Union Cabinet approved an export policy for agriculture in December 2018 and lifted all restrictions on organic and processed food. This is an initiative to help the government achieve its goal of doubling farmers’ income by 2022. The policy seeks to increase agriculture exports to $60 billion from $30 billion in 2017. The government will also invest 1400 crore to set up specialised clusters in different states for a variety of produce to push exports. The biggest dilemma with the subsidies offered to farm sector is that they do not reach 100% to the farmers. While the intention of the Government offering subsidy on seeds, fertilizers, irrigation is not questioned, its implementation remains faulty and the middlemen involved in it usurp a major part of the subsidy amount. Besides, the agriculture subsidy makes the farmer dependant till the subsidy is received from the relevant agency. This is the reason that Government of India has decided to evolve a mechanism to transfer cash directly in farmers’ account instead of payin g subsidy of giving loan waiver. This will help the farmer to reduce the financial burden and buy the required inputs for the crop as per his choice.